Last week, the Organic Consumers Association took a stand outside the mayor’s office in San Francisco to protest the city’s recent free composting program. (Read the article from their site here). It might sound like an odd thing to protest, especially with all the amazing benefits of composting. The national group chose San Francisco to demonstrate against since it is one of the most “green” cities in the U.S. and they felt that it would reach the best audience. Many local governments have adopted the practice of turning biosolids into fertilizer to be sold or handed out for free. A biosolid is made from treated and processed sewage. The EPA claims that these biosolids contain “nutrient-rich organic materials”. Be careful to realize that when they say organic here, they do not mean certified organic, but organic as in organic chemistry. Read more about biosolids on the EPA’s website. The reasoning for taking sewage and turning it into biosolids for farms and gardens sounds compelling at first glance. In the past, this sewage was dumped straight into lakes, streams, and other natural water sources. This puts disease-causing organisms into our oceans and streams as well as other pollutants. The micro-organisms that enter the waters through dumping raw sewage require a high amount of oxygen which depletes the waters oxygen content, killing off larger organisms. Keeping it out of our natural water resources is good, but the current solution of converting to biosolids for fertilizer, isn’t good enough. While it is imperative to keep the sewage out of our oceans, lakes and streams, that does not mean that it is acceptable to dispose of it in other ways that may be harmful to the environment. Our aim should be to find a truly eco-friendly solution that doesn’t overcome one loss just to take on another. It’s important to keep in mind that the practice of converting biosolids from sewage waste, to be used for fertilizer or compost, is completely legal and supported by the Environmental Protection Agency. If you feel these practices are wrong or harmful to the environment get involved by writing to your local legislature, or joining your local environmental grassroots organizations. Even the little things you do can make a difference and it is important to speak up about the things you believe in and see that changes are made. For now however, it may be a better idea to stick to composting at home. 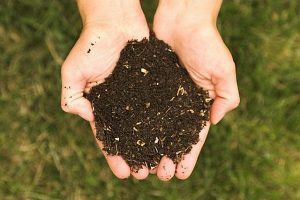 There are many options available that make composting a reality whether you live in a house with a yard, or an apartment. Many local gardening groups may even hold free composting classes to help acquaint you with the ins and outs of proper composting. While you are getting your garden ready this year, don’t forget about homemade compost. It is easy, organic and a lot of fun. I found this article really helpful for getting started. If a beneficial use for biosolids is not found, then they will have to go one of 3 places: in or on the ground, in the water, or in the air (by incineration). In my opinion, it would be much better to be aware of the contaminants in this waste stream so that they may be addressed. We can incrementally weed them out at the source (heavy metals & synthetic organics) or find methods making them inert (contagious contaminants) before composting and land application. It would be more socially difficult, but more ecologically sound to make this solid waste stream safe for composting. The solution, however, is not boycotting its use and committing it to landfills. Thanks for your comments, I agree fully with your statement. I believe the point of the rally (at least I hope) was to alert consumers to the contents of the compost mulch that the city was providing, so as not to use it in vegetable gardens. It would also be worrisome if it was utilized by local or commercial growers to fertilize their crops. Ideally this would be used for landscaping purposes, to fertilize non food sources and therefore being mutually beneficial to the environment and landfills.